Review: Do you like mystery books? Well I do! 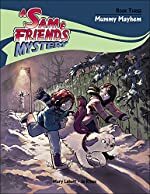 Mummy Mayhem is the third book in the Sam and Friends mystery series. The main character is Sam. Sam wants to go on a field trip with her friends, Jennie and Beth. Their class is going on a field trip to an Egyptian museum. Someone is leaving Sam dog biscuits and they don't know who it is. Is it the pharaoh Menopharsib trying to find Sam? It's up to Sam and his friends to find out! Mummy Mayhem is a great book especially for people who like mysteries, dogs, and mummies. I would recommend the book because it was fun to guess who was leaving the dog biscuits for Sam! It ended up having a great ending! Review written by Hannah (5th grade student). We would like to thank Kane Miller for providing a copy of Mummy Mayhem for this review. Have you read Mummy Mayhem? How would you rate it?